S.T.A.R. railing systems are coated with a durable esthetically pleasing finish process called powder coating. S.T.A.R. railings offer a choice of powder coated color offerings displayed below. Please Note: All colors shown may not be available in your geographic region – consult with your local S.T.A.R. dealer for additional information and availability. Colors displayed are reproduction only and may not accurately represent true color. Refer to actual color samples for true color representation. Custom colors are available. 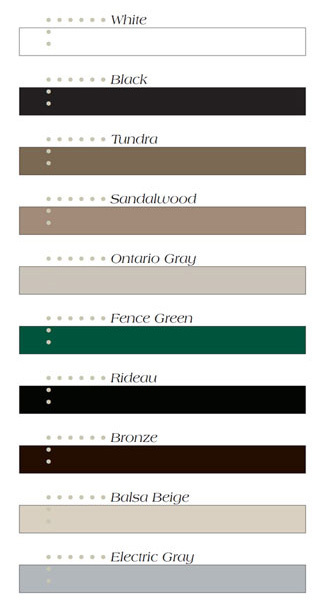 Optional custom color selections are available in a infinite choice of colors and finishes to meet your project needs. We can provide either a infinity number of “off the shelf “alternatives or we can custom blend any color to meet you project needs and desires. Standard coating offering meet AAMA 2604 voluntary specification performance requirements and test procedures for high performance organic coating on aluminum extrusions and panels and optional coating to meet AAMA 2605 compliance are available. All product are covered by S.T.A.R. warranty protection plans.